… but our flagship MLM Blog product with Ty Tribble DOES, plus a whole lot more especially if you’re just a beginning MLM blogger looking to use a blog for leads, sales and sign-ups. Get more information about the most reliable way to generate leads, sales and sign-ups for any MLM with these free videos. Today, I want to help those of you get started with your own MLM blog. We’re going to break the process into small parts just for your first week (six days) of MLM blogging. Use this as a checklist that immediately applies to your MLM Blog marketing. First you have to flesh out your ideas. Aim for 25 blog post ideas. Keep an ongoing folder for fodder on your desktop just for ideas. A notebook works fine too. Once you have your first 25 blog post ideas, use it to plan your second week of content, third week, fourth week, etc. If you publish two posts per week, you should have your first 12 weeks planned out. As you move beyond your first day, and first week of blogging, make brainstorming topics and developing ideas a regular part of your day – even if just 10 minutes per day. I mentioned two posts a week… that’s what I recommend you start with. Find your rhythm. Be consistent. After a few weeks or a month of publishing two posts per week, review your publishing schedule to see how well it suits your lifestyle and your readers’ level of interest – though if you’re just beginning, you will not necessarily have a good gauge of reader interest yet because you might not have a lot of readers yet. But you will have a feel for how well the schedule’s working and whether it needs adjusting. Publish your launch post. Share it with your list (if you have one). Share with your Facebook friends. Tell the world. As soon as you do that, begin the process of finding a blogging buddy. This might not happen on day one, but set your mind to finding a blogging buddy. The second piece of content that you’re going to create is your “My Story” post. Include how many years or months you’ve been interested in the topic of your blog. Think about how you can display evidence of your passion for, or expertise in, the topic area, including links to other work you’ve done or related projects you’ve been involved with. Include how you anticipate your blog will meet the needs of visitors and who your blog is perfect for. It’s likely that creating content is going to be new for you. Here on day two, be mindful of your publishing procedure. Make it a system that can be perfected with practice. For example, I always start with my fodder folder. I choose one specific topic, and then flesh it out on a separate piece of paper. This includes topic research, keyword research, free-flowing hand writing thoughts I scribble in my notebook, and a description of what my ultimate purpose for the post, along with what I want you (the reader) to do as a result. The more specific you are, the better. That’s all for day two. You’re done for the day. Rest, reflect, and schedule your window of time for your MLM Blog tomorrow. Begin developing your flagship content pieces. Flagship content is any form of content created on your blog that has the potential to do some very important things. Bring new readers and new links incoming to your blog (which is a good thing for Search Engine Optimization). Again — more readers. Flagship content MUST be evergreen so that over time you can continually refer to it even if it’s in the deep archives of your blog. Eventually it can bring traffic from search engines (this is IF you do proper keyword research, and your Flagship content is really that good). You can create a special section or category at your blog so that your Flagship content can easily be accessed and your value clearly demonstrated. Sometimes it can be labeled Start Here to ensure that your readers are consuming your best stuff from the time they land on your blog. Think about your industry and write an article that teaches how to do something. Be certain to only write how-to articles on topics you genuinely understand how to do and have experience with. Does your industry have key concepts which might seem like a foreign language to those who are new to your industry? If so, then a definition post is perfect. The important thing here is to present some unique thought. Give your opinion on a major issue in your industry that you suspect your readers will take an interest in. This is by far one of the most popular Flagship content types. Here’s an example of a popular list post that has gotten a good amount of traffic for us. A technical blueprint is focused on the technical aspects of a problem. It might involve the use of graphs, spreadsheets, images and/or video to demonstrate how to do something. Key thing to remember here is that it’s step-by-step and visually enhanced to communicate exactly how to complete a task. You can apply the principle to almost any industry that has common tasks which may be complex to understand. Your goal for day three should be to map out two to five flagship content pieces. These will be the first posts that you work toward publishing for the next week or two. TIP 1 – It’s a good idea to give yourself a 24 hour window to let your post sit. For example, write the post today and publish it tomorrow so you have time to review it with fresh eyes. TIP 2 – In your posts, be sure to format them with subheadings, bullet lists and other formatting elements. Include images for each post. Consider including other media (like video or audio) if it’s applicable. Link to other websites or online resources in your posts. TIP 3 – Blogging is about community. It’s about building relationships with your audience, and having fun exchanging ideas and information with them through the medium of your blog. It’s an opportunity for you to gather eyeballs. TIP 4 – Put yourself “out there” even if you’re unsure. Take time to develop a process for researching your niche for content ideas, to expand your knowledge, to get to know others in the niche, and to gain a clearer picture of your target audience. This is an ongoing, essential aspect of any MLM blogger’s success. You can’t operate in a vacuum. Instead, see what you can gain by looking around the blogosphere. Use blog comments to generate content ideas. I’d recommend that you start with Facebook. Developing a Facebook updating strategy so that your Facebook friends can stay with what you do at your MLM Blog, and your business in general. Look for like-minded individuals and conversations that are naturally occuring. To find conversations, contacts and groups that focus on the topic of your blog (or related areas) search the social networks you’re using for topic-related keywords. This is a great and simple way to find others who are talking about the things that interest you. You can search for Facebook pages and groups. You can search for other MLM Blogs, and social networks like BetterNetworker that focus on quality content and genuine conversations about the MLM blogging. Of course you’ll also want to use Google reader and Twitter Search too. 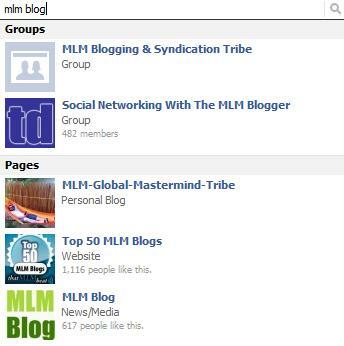 Search inside of Facebook for "MLM Blog." What do you find? Put up your hand and say to your audience, “I have something valuable to contribute.” For many, that is a big step. So, quite simply, HOW are you USING your blogging, and what are you asking it to do for you? And how are you measuring that it worked? This is going to be different for just about everyone, but be sure you’re clear on this for yourself. Sounds obvious, right? Many people never take it beyond their first post. Preferably this post will be a flagship post. If not that’s okay. The flagship posts sometimes take longer to create. The important thing is that you publish another post. Experiment with formats and headlines. Use different frames you can use to shape the key message in your article. A well-honed title can catch the attention of blog visitors, social media users and more. It can help move your post up the search engine results for specific keywords. And it sets users’ expectations about what you’re article will deliver. Here is a method that is helping MLMers become better MLM bloggers if you’d like more information on specific formats and blog templates. Does it include an image of you? Does it tell the reader what your blog will give them? Does it meet any other objectives you might have set for the page (for example, encourage visitors to sign up for your blog’s newsletter or RSS feeds, or to follow you on a social network). Provide testimonials from respected peers, etc.? Does it end with a call to action? Even something as simple as an invitation to check out the latest posts. Doing this can go a long way in keeping readers on your blog after they’ve read this page. Take all of these actions for your MLM Blog’s first week and you’ll be on the FAST TRACK for making your MLM Blog the best representative of who you are and what you do. When you’re ready to kick it up a notch, and go more in-depth, see our MLM Blog Secrets product with Ty Tribble. I like your advice about waiting 24 hours to publish, and I may even add that tip in my 30 day guide. Thanks! I sometimes get too eager when I’m excited about a new post. And right after I publish, I notice grammar mistakes, mispelling, etc even after triple checking. Those small mistakes are easy to fix by simply editing the post…no problem. But it’s a different story if it has to do with the SEO metas (Title, Description, or Keywords), mistake in the link, or forgot to use tags. Most Word Press themes have the benefit of “pinging” Google, Bing, Yahoo, & Ask.com. “Pinging” tells the search engines to check you out. So when the search bots go to your blog, you want to make sure your SEO is optimal. It’s not good to change it after they added it to their search directory. Great point about meta info. Definitely not something you want to forget. That is a separate topic in itself. I purposely didn’t include it here, but that is a GREAT topic for a separate post. I’ve enjoyed your comments, and get a lot of value out of them. You have a nice website. Looks good. Thank you for such nice idea! I think this post and ideas would be usefu not just for begginners but already bloggers as well. Post contains interesting ideas and views about blog running that is useful for wide range of people. Thanks Pavel. Yeah, you’re correct. This can apply to any aspiring blogger. Eric, This is packed with great information. I agree with Pavel, it provides great information regardless of your experience blogging. I think it would be beneficial for anyone who blogs to read this article! I really liked your section on establishing a social media presence. There are a lot of valuable tips on finding others to connect with. In addition to Google Reader, I use Google Alerts too keep an eye out for MLM blogs. Cheryl, good call on the Google Alerts. Definitely a good idea to use Google Alerts. I am so glad to have received this information about blogging. I have a blog but am really stumbling as to content and having good fresh ideas. Thank you SO MUCH for these helpful points. Great timing on this information… One word that really stands out for me is being consistent. Tip: There is a WordPress plugin ‘addthis’ that adds the +1 link to each page on websites. This helps to increase your website’s sociability. rich information, so much to do, thank you!